Making mashed potatoes is a needed thing at Thanksgiving. More important is making good mashed potatoes. Though the author likes a food mill there is no problem with staying with a masher. The potatoes are key though. Stick to russet or Yukon gold. The waxy red bliss won’t work as well in the mash. The dairy needs to be heated up. The hot butter coats the starch and leaves it smooth and then the half and half add more smoothness. Salt and pepper like always to taste. 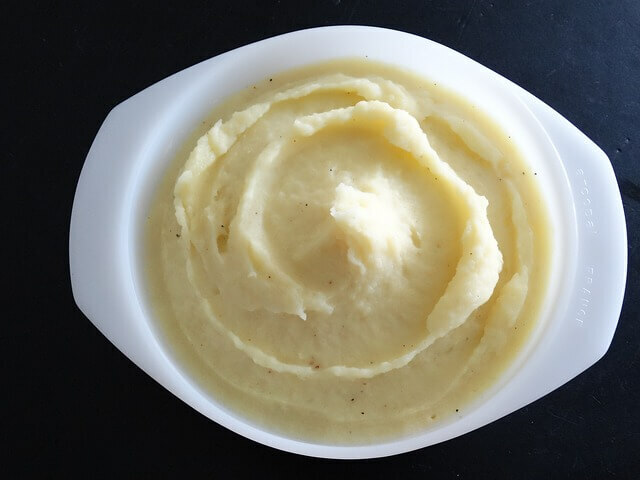 Pick a Yukon gold or russet potato to get smooth and silky mashed potatoes, avoiding the waxy red bliss. While the author prefers a food mill, feel free to use whatever you want to mash, rice or mill those potatoes. Heat the dairy (butter and half & half) on the stove top, so it can coat the starch and keep those potatoes creamy.